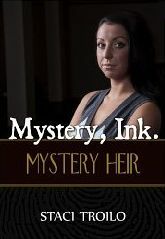 Mystery Heir follows amateur sleuth Naomi Dotson and her twin sister as they try to find a killer. The police have a man in custody, but Naomi thinks they have the wrong person. Her obsession to see justice prevail compels her to continue the investigation, resulting in dangerous and potentially life-threatening consequences. Naomi’s sister woke her and sent her to the living room. Normally, Penelope would have gotten rid of any visitor when her sister was trying to sleep off the stress of having been robbed, but this caller was different. No one turns the mayor away. Naomi stumbled to the living room, trying to rub the bleariness out of her eyes. It didn’t work, so she kept trying. Her eyes would definitely be puffy and bloodshot in the morning, but that wasn’t the important thing at the moment. Dealing with Everett was. She looked at him, her vision finally clearing. His brow was furrowed into wrinkles of worry, and his gaze never stopped roving over her, like he was taking a mental inventory of possible injury sites. He raised a brow and continued to scrutinize her. “You couldn’t afford me.” She yawned and took one more swipe at her eyes. “I’ll walk you out.” She led him to the door and stepped outside with him into the chill of the October air. The night was clear, the crescent moon forming a smiley face with some of the brighter stars in the sky. Despite her ordeal earlier that evening, she found herself smiling back. He pulled her closer, looked down at her face. Their breaths mingled, a misty cloud of potential evaporating into the night. Was he going to kiss her? Did she want him to? Her heart raced, her breath caught. “Good night, Naomi,” he said, his voice husky. He walked away before she could react, respond. She could no longer see him, but she could hear his footsteps, a rhythmic cadence fading away. “Go inside and lock up,” he called. I finished reading Mystery Heir last night and remembered that you had a missing scene here. I loved the Dotson sisters – wish you could write another book featuring them.